GREE is a global leader in social media gaming and always looking for the world’s top developers. What GREE wanted was a tool that could efficiently screen and evaluate candidates’ technical skills before they brought anyone on-site. 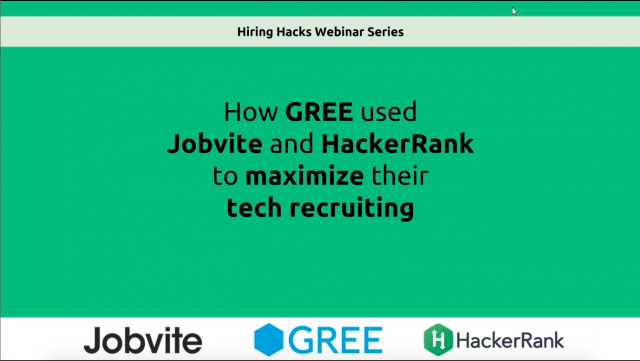 In this webinar, Michael Sewell and Trevor Morgan at GREE share how they leveraged both Jobvite and HackerRank, providing them a more efficient screening process and saving them time, money, and some serious headaches. The search for quality candidates has always been the key challenge for recruiters. But with a recruiting marketing strategy and a few simple tactics, recruiters can easily attract and retain the best candidates, while simultaneously engaging with the hiring team throughout the process. Sound too good to be good true? It’s not! It’s time to make the shift from an inbound recruiting strategy to the new school of recruiting and continuous candidate engagement. The foundation of new school recruiting is data and its emergence as the strategic differentiator in recruiting (just like it is in Marketing). 95% of recruiters expect their jobs to be more challenging in 2017. And with so many new ideas in recruiting, it can be difficult to separate the truly important trends from the noise. Company culture is a hot topic these days. Everyone talks about the importance of company culture these days, but what is anyone actually doing about it? Companies typically fall back on articles crying generational differences, and adapting hiring practices to Millennials or incoming Generation Z, abandoning Baby Boomers or Gen X in the process. In this webinar, we’ll argue companies are asking the wrong question. Understanding generational differences is only part of the battle. Companies should spend time understanding their own company culture and their employees’ personas. Like a Marketing team’s buyer personas, recruiters should be reverse engineering your existing employees’ personas to determine your ideal culture fit. We’ll share how we brought in an outside firm to evaluate ourselves here at Jobvite and how we incorporated the findings in our hiring processes. Generational gaps absolutely exist and affect a company’s culture, but if you’re able to create ideal candidate personas, you’ll be on track to hire the right people for the job and your company. In TalentBoard's recent study, 150,000 candidates shared their thoughts and experiences during the hiring process. Learn how to promote your employment brand in the best ways possible. Hear from David Lahey as he outlines the current job landscape, how candidates see your company, and strategies to manage your employment brand. We'll share actual examples of employer branding success, from companies large and small with a regional or global reach. Winning the war for “right-fit” talent is increasingly difficult, especially for harder-to fill positions. Many organizations are turning to social media and demanding better recruiting solutions to help increase their candidate pool with qualified applicants, but are unsure what the best strategy is for success. Learn why interactive, live, and shareable content is so valuable to your strategy, and how employers can leverage employment assets about the organization’s brand and culture, and help candidates consider them for an opportunity. What do customer success managers look for when hiring the right talent? Find out David’s secret to building out a team that works well together. The days of post and pray are over. If you're still sending mass impersonal postings, skimming thousands of résumés and attending endless generic meet-ups, you're missing out on the talent that can truly change your company. Join Andre J. Boulais, Strategic Account Director at Jobvite, as he shares tips and tricks from 10 years of talent acquisition across three continents. Hear how these methods led to a 44% email acceptance rate in the competitive SaaS field. Whether you're just starting out or a seasoned veteran, you'll take away proven methods to find, engage and retain a top-tier talent pool. - Find hidden talent pools outside of traditional methods. - Increase your email acceptance rate with passive candidates. Jobvite is the leading recruiting platform for the social web. Today's fastest-growing companies use applicant tracking, recruiter CRM and social recruiting software solutions from Jobvite to target the right talent and build the best teams. Jobvite is a complete, modular Software-as-a-Service (SaaS) platform which can optimize the speed, cost-effectiveness and ease of recruiting for any company. For more information, visit www.jobvite.com.